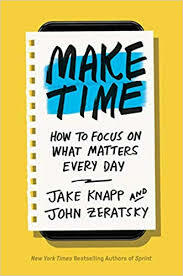 When I picked up this book I was inclined to dismiss it as just another self-help book on time management. Over a lifetime as a manager in large and smaller corporations and as a consultant to both government and private sectors, I often felt the need to find some “cut through” in managing my time, especially as the digital revolution expanded delivery platforms and encouraged so many managers or clients to expect 24x7 access to our thoughts. The authors Jake Knapp and John Zeratsky shared a collective 25 years’ experience in corporate heavyweights like Google, Google Ventures and YouTube. So, they are well-versed in just how distracting social media and email can be. To put it plainly, they are obsessed with the concept of redesigning time. Their basic premise is that you cannot win the battle against distractions with will power alone. Instead, you need to engineer your life to make distractions less convenient. It doesn’t sound like much but it can be a game-changer. In today’s data-driven world we are all familiar with the distractions and the virtual infinity pools social media can take us to. Their suggestions to reconfigure your phone will be highly unpopular with a few generations but their recommendations are serious. They include uninstalling Facebook, Twitter, Instagram and deleting all gaming apps. And even deleting your Gmail or other personal email from your phone. With these distractions removed, some real time management can be achieved. · Highlight – this is where the book teaches you how to assess your days and pick things that are really important to you – the things that you want to make time for. · Laser – this expansive category, showcases different ways to kill off those things that distract you and how to get “in the zone” to deliver your best work. · Energise – these tactics are designed to help you maintain your energy level. · Reflect – there’s only really one or two tactics for this part, but it’s all about tracking your progress and improving over a few days. It’s a quite funny book in places with some very apt analogies and visualisations of their perspectives on the topics. There are drawings here and there, and the content is broken up by segments with the authors sharing the context and background of trying out the tactics. I enjoyed the book because it doesn’t pressure you. You don’t feel like they are yelling at you, making you feel inadequate for not striving to have your time management down to the last 15 minutes of your day. Knapp and Zeratsky are also the authors of the New York Times bestseller Sprint.